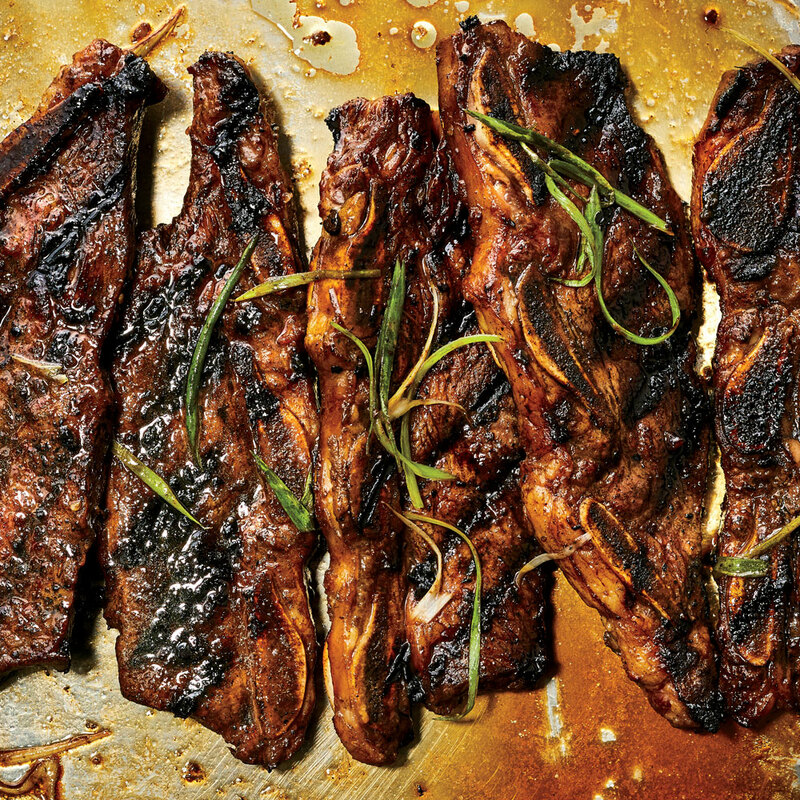 In 2018, Food & Wine named this recipe one of our 40 best: Twenty years ago, way before Korean food was mega-trendy, Los Angeles food writers Linda Burum and Linda Merinoff were singing the praises of kalbi, the flanken-cut beef short ribs typical of Korean barbecue. The short ribs are marinated overnight in a simple mix of sake, soy, sugar, garlic, and sesame oil. Cooked quickly on a hot grill, the juicy meat is tender with a satisfying chew. They make a stunning main course served alongside kimchi, lettuce leaves, and steamed rice. For the best results, ask your butcher to slice three or four ribs across the bone into 1/2-inch-thick pieces, and plan to marinate the meat overnight. The marinade is also delicious with chicken or pork. Place ribs in a large glass baking dish or enameled roasting pan; stir together sake and granulated sugar, and rub on both sides of ribs. Cover and let stand 15 minutes. Meanwhile, stir together soy sauce, scallions, garlic, brown sugar, and sesame oil in a medium bowl. Add 1 1/3 cups water, and stir until sugar dissolves. Stir in vegetable oil and pepper. Pour soy mixture over ribs, and turn to coat evenly. Cover and refrigerate 8 hours or overnight. Return ribs to room temperature before cooking. Discard marinade.